Inside secrets and never-before-revealed stories are shared in this one-of-a-kind book by Child Care Business Success Mentor Julie Bartkus. Julie’s mission has been to help child care owners create their positive, productive and profitable child care businesses for almost 20 years, and now in her book, Child Care Business Success, she interviews several child care business owners who stand out above and beyond all others in their communities because of one thing. This one thing is THE thing that Julie is so very passionate about sharing with child care owners worldwide. It has the power to transform child care programs, including filling enrollments in record time, attracting and retaining DREAMY staff and clients, and sustaining a motivated and dynamic team; this allows child care owners to experience the time, freedom and profits that they desire and most importantly deserve. Are you ready to discover the power of this one thing and get really DREAMY with your child care business? “Being mentored by Julie Bartkus has brought me so many gains, both professionally as a child care business owner and personally. As I’ve implemented her strategies over these past two years that we’ve been working together, I’ve seen a transformation in my business that I didn’t even know was possible. In the first three weeks alone we enrolled thirty-six children—far more than we ever had enrolled before in that short of a time. “But the benefits far exceed enrollment. My vision has become a powerful force in our program. Families recognize a difference in our program and want to be part of what we offer. Our teaching team has become more professional and aligned with the vision of the company to wrap our arms around our families. We no longer struggle with petty problems, but instead forge pathways to new levels of excellence. In one year we went from a program with a provisional license to a four-star program, and we have increased revenues for our single site by over $200,000 per year. 5.0 out of 5 starsThis is a MUST READ for child care owners who want to see a positive change in their program. 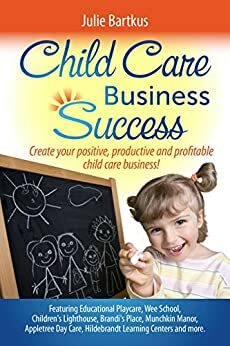 Julie is amazing and her book consolidates much of the wisdom she has collected in all of her years of helping child care business owners create more "positive, productive and profitable child care businesses." I have been working with Julie for almost three years now when my husband and I bought an existing preschool that has been in operation since 1963. In that time, I have seen a dramatic difference in my child care business. First, my staff turnover is staggeringly low. In 2015, with a staffing need of 15, I turned over 20 people! In 2016, we closed our School Age program so we needed a staff of 11 and we turned over 10 people. This year to date, I have had to fire 1 person!!! Second, the turnover in families has dropped so we are keeping more families than before. Lastly, since June 1, 2017, to now - August 7, 2017 - we have enrolled 16 new children at a time when typically enrollment is non-existent. Over all our enrollments are up, from 36 in October 2014 to a high of 53 this year. I can't say enough about Julie and her book - read it and reap the rewards! 5.0 out of 5 starsBest book for childcare. There are many books, groups, conferences and mentors for the childcare field. What makes Julie Bartkus different? Julie is able to meet you where you are. She finds your inner strength, your passions, your vision, your weaknesses, your desires and pushes you out of your comfort zone to not only strengthen and grow your business but you as a person as well. Julie is genuinely concerned about who you are and how you can become the best you can be! Usually we are the ones that are holding our businesses from being profitable and Julie is able to shed light on what and where we need to look.This book is a must have. Once you have read the first page you will know that you have found a person who knows the childcare business and is willing and able to help you take the next step to success. 5.0 out of 5 starsAmazing book for all Child Care Owners and Directors! Life Changing! As an Early Childhood Professional who has assisted in opening four child care centers, I fully recommend Julie's book! Wow! I am so excited for owners and directors to have this amazing book to guide them. Julie is elevating the child care business to a new level in so many positive ways! Unbelievable amount of insight into what makes it possible to be successful in a very challenging industry. Must read for anyone wanting to open or expand. We've been at it for 32 years, but found plenty of food for thought. Julie Bartkus has created the book of my dreams! I devoured it cover to cover! I could not put it down! This should be in the hands of every Child Care Owner and Director.